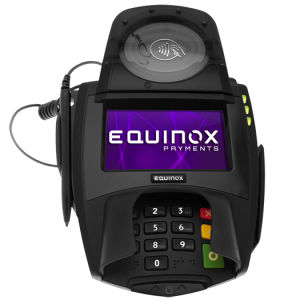 The Equinox L5200 is a reliable multi-lane terminal, and at a lower price than comparable Verifone and Ingenico signature capture terminals. Over the years, our clients have used all the top three brands with varying reliability. When buying a car, you can easily define good, better, best. That’s not so with multi-lane terminals. Will the unit fit in the space I have? Do I have to get a stand for it? Is the screen durable enough for my volume? How long has it been in the market? (New product lines may have reliability problems.) Or, what’s been the reliability experience with similar customers? The L5200 has a sister product, the L5300, which is basically the same product, but with a bigger screen. The L5200 is ideal for automotive, truck, distributors, business to business, and any retail locations desiring a reliable signature capture terminal, a small footprint, and not requiring an permanent stand. Multi-lane Software: What will drive the units? The L5200 can be used standalone with any virtual terminal that supports multi-lane, and with POS applications. For example, they can be used with CenPOS, a universal payment gateway with virtual terminal. Contact 3D Merchant Services for CenPOS connectors for open source ERP retail software such as OpenBravo. This entry was posted in CenPOS, Equipment-POS and tagged CenPOS, contactless, emv, Equinox, L5200, multilane, p2p by Christine Speedy. Bookmark the permalink.